VICE President Yemi Osinbajo, today, gave reasons the Federal Government partnered with the Africa Development Bank, AFDB, to invest $500 million in the nation’s economy. Osinbajo said this during his visit to Epe as part of his ongoing door-to-door campaign in South West in company of Governor Akinwunmi Ambode of Lagos State where he also met with the Oloja of Epe, Oba Kamorudeen Animashaun. 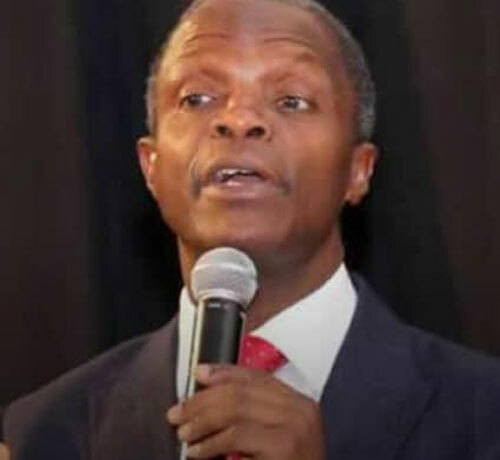 The Vice President said: “At the next level, government, aside from all these initiatives, we also want to establish Entrepreneur Bank and Peoples Money Bank to complement the Bank of Industry. What we have realized is that we need to create several avenues for people to access funds to set up their businesses, and thereby create opportunities for more jobs. “Already, we are in partnership with the Africa Development Bank, AFDB, to invest $500 million in creating jobs. “All these things ought to have been done before now, but corruption has prevented us from enjoying these things. We are at a point that we need to tell ourselves the truth because the country ought to have moved far ahead of where we are. “If the leaders are corrupt, there is nothing that can move. It is not as if there is no idea to move this country forward. As a matter of fact, there are several ideas but corruption has refused to allow these ideas to come into fruition. Also speaking, Governor Ambode urged residents to troop out on Election Day and vote massively for all APC candidates. Earlier, Ambode had raised concerns over how some lawmakers spend constituency allowance received on behalf of their electorate.